My first few hours in Iceland have not been filled with anything that I would call joy or a good time. I guess someone has to have a bad trip and today it was me. By the time I got food into me I had been up for over twenty four hours and I found the places lack of a menu distressing enough to start leaking tears of pure stress. The rest of the blog is just about how not smooth my trip has started off. It started with the flight. Icelandic Air has lovely, clean, modern planes. The seats were also the narrowest I have ever sat in. It is one of those moments when I wonder if I've tripled in size since my last flight. I spent five hours sitting bolt upright with my arms pressed against my body trying not to invade my fellow passengers space. Things were okay until around the fourth hour when we fly into dawn and the plane started to become a hot, uncomfortable place. But five hours isn't that long to endure so I endured and vowed to lose four or five hundred pounds and have a shoulder and hip reduction before heading home. My flight had at least three other Eve players on it. They were in the two rows directly below me. At take off they all kind of said hi to each other after someone said they were going to Fanfest. One was from PL, one was from Razor and one from Heretic. It was cool listening to them chat and I had the burning desire to join in but due to cramped seat and shyness I just enjoyed people talking about Eve. One of the things I was looking for was sim cards for my phone. I had a particular provider that I wanted to use for the week and they sold cards on Icelandic Air. The problem was that after the first go around the flight attendants vanished until it was time to land. They did a few fast walk throughs and avoided eye contact and vanished when I tried to ask a question. Irritated I decided I would just buy one at the airport. I'm not an in your face person and I will just move to the next option. Upon landing the ground is covered in snow. "Maybe this is old," I think. "My phone says it is raining and it's almost May." Nope. It was snowing. And snowing. Okay, whatever. We pull up to the terminal and a ramp is wheeled up to the plane. Exiting is down the ramp and through the snow to the building. I have my travel clothing on which is light weight stuff. My shoes are not waterproof so wet and cold I get inside, get everything, decide its an adventure and go off to seek the phone sim so I can reconnect to everything. Customs was painless. The customs officers are kept in glass booths slightly above you. It was kind of weird feeling. The first place sends us downstairs and says we have to buy it from the shop after baggage. The shop after baggage sends us to the shops register. At the register we attempt to explain that we want a new card not a refill. For some reason this has her staring at us as if we asked for fresh calf heart. After checking all the registers the girl tells us that they are out. Maybe the 10-11 store at the front. So, around the people buying carts full of beer and off to the store. Simin had said that the 10-11 store stocked cards. We got our baggage under the cool Eve Online welcome to Fanfest page and went off to find the cards. At the 10-11 store the guy proceeded to try to sell us the other two providers cards and not Simin. Vonage and someone else. Both do not have the best service from what we have researched. He even tells us he doesn't like selling this one to people. He was told that we gave no fucks (but more politely). He eventually produced a card and announced that he did not know if it was a micro sim or if it would even work and wouldn't help us find out. Purchased the card anyway because we had a cutter. Turns out it was a micro sim. I had to call to activate it and work through some menus that liked to reset as well as instructions in non-english. Once the phone was set up finding the rental car involved wandering in circles and finally calling the place only to learn that they send someone to pick you up and we missed that. I didn't know because I didn't schedule the rental. He hadn't read all the way down the information e-mail. Car acquired we realized we knew nothing about Iceland addresses. Trying to find the hotels address produced something that was maybe an address but who knows? Icelandic words scare me a bit. My mind can't process them at all. 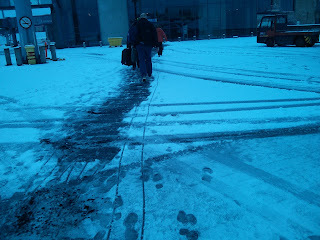 We picked a cross street and just headed out in the snow, across the tundra to meet traffic. Lots of traffic. Two hours worth of traffic at that. The twenty minute trip took two long frustrating hours of people driving up shoulders and turn lanes, cutting into traffic at aggressive angles, jumping in front of people, and in general acting like assholes on a good day but like idiots in the snow. I'm sure in a country where snow is more common it wasn't such a big deal for them. 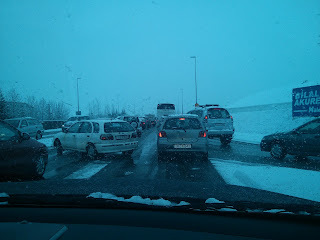 For me, having people wedging themselves into traffic with sudden starts and stops and having to bumper hug not to be kicked out of your lane by more aggressive drivers and all during a snow storm was insanity. Landing was around 0640. At 1000 we finally reached the hotel. Once we got there the hotel parking has a sign that shows that non guests will be towed. That makes me want to get a parking pass quickly. We walk around the building looking for an entrance and eventually find one. Only, it is to the ministry of Fishing or something. Back out and around and it turns out that alcove that was full of people smoking was the entrance to the hotel. Once inside there is no early checkin for us. Also, even though there are tow signs the car won't be towed. I have a hard time with this. Where i am from your car will be towed. She says no. I'm just waiting for the inevitable. Four hours to burn and I am exhausted and now we have to go walking for food. That involved some circles and a crape place. It looked nice and had tea and coffee and sweets. I wanted food and said we could come back for coffee (for him, I don't touch the stuff). 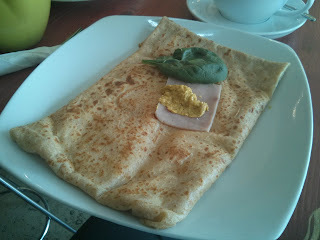 The lady pipes up that they have savory crapes with eggs, ham, cheese, etc. But no menu for it. For some reason my cold, wet, tired mind loses it here and I am completely upset that I have been offered food verbally and don't have a menu to ponder over. I am also not used to small business and the entire no menu to show that they have these foods. It does not fit into my ordered understanding of receiving food from a place. I just wanted to leave at that point but my husband seeing I'm having a breakdown fit for a sleepy toddler decides we are going to stay. So, I go sit in the corner to leak exhausted, frustrated, angry tears while food and tea is ordered. I also don't like sitting in very open places where the people on the street can stare at you. Pretty much, I like absolutely nothing right now and the lack of a menu is my breaking point. However, the food was good and I will go back. Once fed (it had been about ten hours since eating or drinking at this point) things were a little better. Another, cold, wet, slushy walk to the hotel and I zonked out in the car while he went to find a Sim and a power adaptor. The question for the sim card worked but no power adapter has yet been found. I just napped, badly, until like magic finally at two we could check in and I passed out for a few hours of sleep to hopefully regain my humanity and a reasonable humor. The room is small but neat and clean. The Harpa is across the street. I really wish that I had just stayed at the Hilton but we will see how things go from here. P.S. Late edit. I wrote most of this post on my tablet. Go Nexus 7! 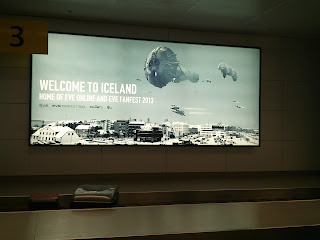 Welcome to Iceland, enjoy your stay. I don't actually know what these temps are. My husband keeps lying to me as well to harass me (hes from England so this is normal for him). I need to download an american measurement to the rest of the world app tomorrow. Guess it's reversed for me, I never know what these °F's are. And whenever I see 180°F I think about a massively warm baking oven. Your description sounds like my first day in Japan: underslept, underfed and unable to read or understand anything due to strange language and symbols. After a long sleep and sufficient food, things stabilized. They will stabilize for you too. I had such a fantastic first day in Japan :( Except for the long, hot, airconditionless walk through the airport.